Vern Burkhardt (VB): You are Irish and grew up in the UK. How did you end up living in Shanghai and speaking Mandarin? Warwick John Fahy: I love to travel and spent my summer holidays at university taking shoestring trips across Europe by train and flying across the USA in the days when you could buy a one month air pass on Delta Airlines for about $200! I have lived in Asia since 1994, with extended placements in Taipei and Shanghai since 2002. I still have the travel bug and have a long list of countries I would love to visit. Next on the list Vietnam and Fiji. I felt that working in China and, with the increasing importance of China on the world stage in the coming decades, Mandarin wouldn't be a bad thing to learn. Unlike my multi-lingual friends, I am not a natural linguist! So speaking Mandarin is a lifelong learning journey for me! The more you learn, the more you realize how much you will never know! I deliver speeches and provide training in Mandarin now, and I am happy with that. VB: As you say, we have witnessed a dramatic drop in attention spans of people, especially with "digital natives" who can speak "DSL" – digital as a second language. Do you foresee the habit of thinking "fast, in bursts" as having a negative impact on people's ability to be innovative and creative? Warwick John Fahy: I would be surprised if it did. Although a recent Newsweek article points to falling creativity in the US, I suspect that digital natives will find different approaches. Innovation is essentially finding a solution to a problem by using a process of divergent thinking – idea generation, and convergent thinking – focusing in on a solution. Digital natives will use technology to solve problems. For example, crowdsourcing is becoming an established way of solving problems through technology that did not exist five years ago. Perhaps, it is the digital immigrants that need to adjust to the digital natives. From one perspective a digital native has a perceived short attention span but if you have ever seen a teenager playing a multiplayer online game, like Counterstrike, they seem to have no problem concentrating for hours at a stretch. The challenge is how will these clashes of styles adapt to each other inside organizations? VB: What is the One Minute Presenter? Warwick John Fahy: The One Minute Presenter is a metaphor to describe the journey of a modern successful business presenter. I divide the journey into 8 stations. For example, the third station is called "Produce your Message" which applies techniques from the advertising and film industry to help business presenters create more memorable messages in a shorter time. The One Minute Presenter is always ready to present. The main problem with today's business presenters – I work mainly with senior finance executives – is that they think preparing a presentation is about making a slide deck. While visual aids are important, you first need to work on your message, and then boost your performance with effective rehearsal. It doesn't mean literally giving a one minute presentation, but more a way of preparing. If you can distill your key message and ideas into a one minute presentation, then you can expand it to a five minute, ten minute or twenty minute presentation. It's more difficult to cut down a thirty minute presentation into two minutes if you have not first condensed it into its core essence. With the coming wave of mobile marketing, this skill will be even more important. We will have to become more and more like video producers to create concise, compelling and memorable presentations. VB: "You Become a One Minute Presenter, one presentation at a time." Would you talk about this? Warwick John Fahy: Learning is a process. Every time we take the time to review and evaluate the delivery of a presentation, we increase our awareness and take another step forward. Unfortunately, people tend to have an unrealistic approach to learning. Either expecting instant results or not taking the time to reflect on their activity. Activity without reflection is like groping for a light switch in a dark room, lots of fumbling and tripping over without any guaranteed progress. I am a big advocate of videotaping and reviewing my presentations. Each time I review a presentation – it is like a flash of light in a dark room – I can see a way forward. Take a few steps forward and then review again. The world's best presenters are avid observers of their own presentations. I also take a flexible definition of presentations. As well as the formal stand up and deliver-with-slides format, today's executives need to be able to project themselves and their messages in conference calls, and one-on-ones with their managers and direct reports. They need to be able to influence clients in social settings. And motivate larger audiences in conferences and annual meetings. As a senior executive, every time you are in front of an audience you have to be ready to deliver a concise message that is relevant for them, and deliver it with energy and confidence. VB: You say that a presentation should have a happy ending. What does this mean? Warwick John Fahy: The happy ending is the destination of your presentation. Where do you wish to take this audience after they have listened to you? The definition of a happy ending will change every time. When you are informing your team at a weekly briefing, your happy ending could be that they clearly understand their deliverables and actions for the coming week, and they also feel that their work is contributing to the overall strategy. When facing a client, your happy ending may be to build their trust in your capabilities by sharing specific solutions to their current problems. Having a happy ending helps you measure the success of your presentation when you review your performance. A good happy ending can be expressed in 25 words or less and cover what you wish the audience to think, feel and do. For example, at the end of the presentation the client will "think we are competent, capable, and ideally suited to help them. The client will feel comfortable with our communication styles, and select a project start date." VB: What would be an unhappy ending? Warwick John Fahy: An unhappy ending is a presentation that did not reach its intended outcome. Another type of unhappy ending is where the audience feels the presentation was a waste of their time. VB: "The more comprehensive you are, the less effective you become." Would you talk about this? Warwick John Fahy: The paradox of smart people is "We know too much, so we say too much." Every effective piece of communication has a core message with supporting materials to illustrate that message. Consider, for example, a finance executive who needs to brief senior managers on the quarterly results. A typical approach is to read out the numbers in great detail – often with a very detailed spreadsheet on the projector. This approach is comprehensive but ineffective for a senior management audience. A better approach is to tell the story behind the numbers. What is the shape of the performance? Are we heading in the right direction? What needs to be done to achieve targets in the next quarter? Switch from a data-dump to a message based delivery which selects the important data to highlight, and drops the rest into a handout or emailed spreadsheet. An example from the advertising world highlights this approach. The Mandarin Oriental hotels took their logo, which is a traditional Asian fan, and created a series of magazine advertisements around famous people who are 'fans' of the hotel. The strap line is simple; "He/She is a fan." No further explanation is given unless you visit their web site. No details about the facilities, location or other benefits. The key is to understand what level of detail your audience requires from you in a presentation. The challenge for many business executives is that they believe the only way to demonstrate their competence is by telling the audience everything they know. Packaging your message and filtering it in bite-sized chunks is a more effective approach. VB: Do you need to be a recognized expert in a field in order to be a credible presenter? Warwick John Fahy: It certainly helps! In a short attention span world, people tend to look for short cuts. So when Bill Gates and Warren Buffet come to China to speak to fellow billionaires on the benefits of philanthropy, they listen. Will their message be any different from the thousands of volunteers working in charities? The core message is likely to be the same; their status helps to boost their credibility. You can still be credible without expert status. Clearly expressing a deep understanding for the motivations, desires and pains of your audience will make you credible in their eyes. This will be even more so if you have solutions to some of their pains. An enthusiastic and passionate delivery that engages the audience with relevant stories will also enhance your standing in their eyes. At the end of the day, audiences are asking themselves "what's in it for me?" if I listen to your presentation. The best presenters make it clear what those benefits are, and deliver on them. VB: Do the numerous tips you provide in The One Minute Presenter apply primarily to digital natives? Warwick John Fahy: Not exclusively. While my focus is on helping busy executives craft compelling messages and deliver them with an engaging style for distracted and inattentive audiences, there are some core skills that apply for every audience. The sixth station is called "Manage all Interruptions" and these tips apply for any audience in any situation. The key stations for digital natives are station three "Produce your Message," and station four "Create your Connection." Digital natives prefer presentations to be an experience rather than a one-way information stream. They wish to participate in the message rather than just absorb the message. VB: You advise, "Your presentations should have one message and one clear outcome per presentation." What if we are keen to give more than one message because we have a lot to say? Warwick John Fahy: We risk overloading and possibly confusing the audience. A better approach would be to have a clear core message and outcome, and attach sub-messages to this main idea to illustrate it in different ways. Vince Lombardi, the legendary American football coach, was famous for keeping his strategies simple. His approach was to have one strategy with multiple variations. A presentation with two or three messages will not be remembered. In "Being Wrong," Kathryn Schulz illustrates how bad our memories are when it comes to remembering even traumatic events like the space shuttle disaster in 1986 and the Trade Towers in 9/11. When students were asked for their memories of these events at two different times, fewer than 7% of the second reports matched the first, and 25 percent were wrong in every major detail. If this is the case for such memory-burning events, it shows how difficult it is to rely on memory alone while conveying a message. If you cannot umbrella your message into a single core message, then seek to find a compelling story that illustrates the point. Use a key graphic to support the story's message and use a slide that has the visual image with a tagline of the key message. Messages are best remembered as stories and the memory has a higher recall when relevant pictures are combined with text. VB: What advice do you have for those who are so afraid of speaking in front of groups they will do everything possible to avoid it? For example, by nature they may be shy and introverted. Warwick John Fahy: Focus on your strengths. Think about situations where you have communicated with confidence. I coached an entrepreneur who had developed a resistance to speak in public, but after a short conversation we realized that his sporting background as a rugby captain could be used to help overcome this resistance. Any successful achievement can be used to help shift someone's mindset from failure to success. I work a lot with technical people from finance, engineering and government. These roles tend to favor people who are very good at the task-oriented details. This aptitude has helped them make progress in their careers. They also tend to be more introverted than the archetypical salesperson or leader. I make a process for them to follow before they speak; for example, checklist before the presentation, last five minutes preparation, first two minutes opening. This gives them a way to make progress in becoming a more confident speaker. I tell my clients that 'nerves don't go away, fear does'. It is normal, and it's even a good thing, to feel nervous before an important presentation. You can channel this energy into your delivery as enthusiasm. VB: Is one of the indicators of having become a highly competent presenter to be able to make presentations to groups irrespective of size without experiencing butterflies before, or being nervous while, making a presentation? Warwick John Fahy: No. Most presenters I know do experience butterflies or nerves beforehand; you just won't see it. The indicator is that a highly competent presenter is always ready to present. They can adjust their message to the audience and time available, and deliver it with confidence. I was once called up at 0630 to replace a host at a conference for five hundred people that started at 0830. Several people had turned the organizers down due to the late notice. I accepted partly to be of service, but also because I feel that I am always ready to be on stage. I have developed these skills by taking on new challenges, like hosting a stand-up comedy night, performing in an improv show, and taking on a TV hosting role. Also worth remembering is an audience will forgive you making the odd mistake here and there. They won't forgive you being self-obsessed. In the above example, no one in the audience knew that I was a last minute stand in. I focused on making the experience as enjoyable as possible for the audience. Staying audience-focused is the secret to success if you have to take on such a last minute assignment. VB: Do you agree that the presenters who appear to be the most relaxed and impromptu are often the ones who have spent countless hours preparing and practicing their delivery? Warwick John Fahy: I agree that rehearsal will absolutely help you come across as more prepared. And the chance of delivering a better presentation is higher. As you know your content inside and out, you can then focus more attention and energy on connecting and engaging with the audience. If you need to look down at your notes every five seconds or you are facing a screen to see what your next point is, eye contact is broken with the audience and this reduces your rapport with them. From the audience's perspective, when they see you shuffling through notes, they feel that you are not prepared, and this may hasten them to lose attention even quicker. Good rehearsal means that you have to deliver your presentation in a similar environment to the actual performance. If that is a meeting room, book out an hour and go to speak out your presentation. Record your delivery and review, adjust and re-deliver until you feel your know your content. This may take up to ten rehearsals. If you are speaking at a conference, you may need to prepare in a smaller venue until the day before the conference, when you can gain access on-site. When on-site you will work with the technical aspects, like setting up computers and projectors. And then get comfortable on the stage with a dress rehearsal. VB: How did you become an expert in preparing and making presentations? Was this an innate ability? Warwick John Fahy: Absolutely not. During school and up to my late twenties I would do everything I could to avoid speaking in public. This was because I had ended up in tears during a drama class when I was twelve years old. Even when I had a job that required me to deliver 100 presentations a year, I was still not that comfortable until I joined an organization called Toastmasters International, a non-profit organization with around 260,000 members in over 12,500 clubs in 113 countries. The main benefits I gained from giving speeches in Toastmasters were the enthusiastic and encouraging audiences as well as specific and constructive feedback. They really built up my confidence and, along the way, I discovered that I really had a passion for public speaking and for sharing these skills with others. I am also a compulsive recorder and reviewer of my presentations. I record every speech I deliver with video or audio and re-listen to the delivery. I identify areas that were done well and then pick out the places that could have been smoother. I write down how I could improve them, perhaps with a better choice of words, a change in vocal intonation, a longer pause, or by getting to the point quicker. I find that this process has helped me become a better speaker and it keeps me focused on continuing to improve. In addition, I frequently watch great presenters in action and listen actively to interviews with CEOs to see what they are doing well. TED is a great resource of good, and not so good, presentations. VB: 'Most "Death by PowerPoint" sessions create audience massacres because they forget that the focal point should be the audience, not the slides.' Do you use PowerPoint in your presentations, and if so what is your secret? Warwick John Fahy: I occasionally use slides. I never read from the slides nor use the slides as a script for my presentation. Slides should only be a visual aid to support your presentation. The best slides are those that reinforce your core message and supporting materials. So use very little text and have a strong impactful visual element. Slides should be designed like outdoor billboards. You can get the impact immediately and the message in a few seconds. A picture tells a thousand words, but a picture with a tagline will help the audience understand the important words to remember. Data heavy material can be printed out and made available in hard copy, which is easier for the audience to read. Or it can be emailed before or after your presentation. VB: What are some of the favorite topics for your presentations? Warwick John Fahy: Lifestyle design and lifelong learning. I use examples from my experience such as learning Mandarin, training for an Ironman triathlon, eating vegetarian food in China, adapting to different cultures, and stories around lifelong learning. Regardless of topic, you need to develop your speaking skills so that you speak with your own voice. Senior executives need to be authentic when they present, and one way to do this is to use examples from their own life. I always try to select examples that best connect with the audience. To highlight a message on the importance of processes, I may use examples from how I put together a one year training schedule to prepare for an Ironman race. To illustrate shifts in behaviors or drastic changes, I can call upon my decisions to quit drinking or start eating vegetarian food. These stories deliver a point like "change requires a support group," which by itself may not stick in people's memory. Using an example of how I put together my triathlon support team allows the point to be delivered through an anecdote or story, which is more interesting to listen to than a list of bullet points. It also has a higher chance of being remembered. We don't speak in bullet points. If a client asks you why they should work with you, you don't say, "Experience. Resources. Support. Technology." Rather, you would probably share an anecdote of how you helped someone similar to the client. VB: Would you tell us about the presentation you have made that you are proudest of, where your audience was fully engaged? And how you went about preparing for it? Warwick John Fahy: Hard to choose one but I would like to share how I prepare. I like to use the metaphor of how a theater troupe prepares. There are five types of rehearsal; script read through, the run through, cue to cue, top and tails, and finally the dress rehearsal. Most presenters barely get to step 1, which is having a final outline or script for their presentation. I rehearse using an 8:1 ratio for new material; that is, I prepare for 8 hours for every 1 hour of delivery. I spend about 20% of my preparation time working up a draft outline, the core message, and supporting materials, like anecdotes, visuals and props. The final 80% is spent in rehearsal. Step 1 involves a very quick draft of the speech. I use pen and paper to brainstorm key areas, sometimes using a mind map or post-it notes to arrange key points. The result is an outline of the speech. For Step 2, I speak into an audio recorder to run through the material until I memorize the flow. I don't usually have a word-for-word script, so every delivery is slightly different. After a few times I refine the content and write down a skeleton outline with key words to prompt an anecdote; for example, "earthquake change" or "Paris story." At the end of this step I will have a good idea of my content, the flow, and the supporting material. Step 3 is cue to cue where I work on my transitions, gestures, and movement on stage. For larger speeches I will note technology cues, especially where music or other audio-visuals are used. Step 4 is top and tails. I focus on the opening and closing to make them as dynamic and impactful as I can. I don't memorize my presentations word-by-word, except for the opening and closing 30 seconds to one minute. It is reassuring to know that you could still deliver a powerful close if time is tight. Step 5 is the dress rehearsal which takes places on-site and involves a full run through with all equipment. VB: Have you ever had an occasion when something made you feel embarrassed while making a presentation? If so, how did you deal with it that could be a learning moment for us in the use of self-deprecating humor? Warwick John Fahy: If you give enough presentations you will face all kinds of unexpected situations. Like technical issues with computers crashing, or people walking across the stage. The best approach is to keep a sense of humor and always be ready for the unexpected. It helps keep you sharp! Self-deprecation is the safest type of humor. I frequently tell my clients to avoid telling jokes unless they are great joke tellers, as they are so hard to deliver and carry a high risk of bombing. Self-deprecating humor, which is the ability to laugh at yourself, allows the audience to see that you are humble, have a sense of humor, and it also takes any tension out of occasion. One caveat is to remember that you still need to maintain your credibility in the eyes of the audience, so don't put yourself down too much. A bad example would be "I didn't prepare for this presentation," or "I am not a good presenter, so bear with me." While the audience may chuckle, it doesn't build you up in their eyes. Better examples are often more situational; for example, challenges you have faced coming to the event, surprises from being in a new country, or cultural differences you have faced and had an insight from. In Shanghai, sharing an experience of how you felt while taking a hair-raising taxi ride brings empathic laughter. VB: You are general manager of TEAMSWORK China. Would you tell us about this enterprise and the services you provide? Warwick John Fahy: We help retain and develop talent for multinationals in the technology, industrial, and financial sectors. We do this by providing executive coaching, leadership and management training programs, and by facilitating strategic planning sessions and off-site executive retreats. As a group, we provide consulting, training, and executive coaching services across Asia Pacific and the Middle East, so I will often travel to facilitate programs in other countries. In China, I conduct communication workshops for managers and coaching programs for senior executives looking to improve their influencing skills. As a certified professional facilitator, I also help managers and leaders to adopt group facilitation skills into their meetings to engage with their staff, increase interaction, and get tangible results from their time together. We have a multicultural team capable of delivering programs all around Asia in multiple languages. VB: In what countries in Asia have you provided business presentation coaching for senior executives, business leaders, and entrepreneurs? Warwick John Fahy: I work all around China, Hong Kong, Singapore, Korea, and have also worked in India and UAE. I coach senior executives from all around the world. Being based in Shanghai means I come across people from almost every nationality. VB: Do you have any tips for making presentations to an audience composed of people from many different cultures? Warwick John Fahy: When I present to a diverse audience, what I look for first is commonalities. For a business audience, common stakeholders are readily identified; customers, investors, managers, community and government. This helps me connect to them on a practical level. I can share business examples from other countries and find ways to apply them to their situation. Then, I look deeper into the culture. I compare the culture to countries I have already worked in. I just visited Korea for the first time for a number of client engagements and during my research found similarities with Chinese culture in terms of their Confucian background. So that means hierarchy, respect for family relationships, and a top down decision making framework. I then contrasted the two cultures to learn about the stronger sense of national identity people feel in Korea, and the drive and intensity that took Korea out of the ashes of the Korean war to a first world nation. I use these to find ways to align my message in a way that will connect with some of these motivations. It may also mean I would select certain stories that the audience can better relate to. A Western audience may connect strongly with an individual overcoming various obstacles; for example, single-handed around the world voyages or climbing to the top of high mountains. Whereas an Asian audience would relate more to a story that placed the individual accomplishment in the context of social relationships. The danger is to over-generalize differences with broad brush strokes. Culture is all about fine nuances. If I don't know anything about a culture, I will be respectful, polite, and share up front with the audience that I may make the odd cultural faux-pas. I keep an open, curious and humble mindset in these situations. Lao Tz advised to be like an 'empty vessel' which is good advice. VB: Will reading your book make us better presenters? Warwick John Fahy: Yes, if you practice. Learning is a process. Try it, review it, adjust one thing, and try again. The One Minute Presenter is designed so you can dip in and out of it. Take a tip, try it out, and then come back for more. VB: You also acknowledge your "teachers." What are some of the key lessons you learned from them? Warwick John Fahy: Good teachers help lay solid foundations and shape your values. From Jack Stack I learned, "you get what you give" which is a core value in everything I do. I read widely from different sources and am always open to learning new things. Whenever I listen to a speaker I ask myself, "What is one new thing I can learn and apply from this talk." Actively seeking and applying is the best way to internalize the new ideas. Stephen Covey said that the best way to learn is to teach. Another great insight. VB: You dedicate The One Minute Presenter to Mum. In what ways is she the "best?" Warwick John Fahy: Selfless in her determination to educate her four children, and boundless in her ability to connect with and meet new people. VB: Do you have any additional advice for how to become a one minute presenter? Warwick John Fahy: I am a great believer in role modeling. When you learn a new idea, try it out. Role play. Suspend all your beliefs and just see what happens. Today, too many people 'know' without being able to do. My motto is to learn by doing as long as it's fun! One final tip, if you wish to push yourself outside your comfort zone, participate in an improv show or open mic stand up comedy night. You will learn to stay in the moment with improv and learn about being audience connected with stand up. VB: Thank you. You've been very generous in taking the time to share your excellent advice and tips. Now we need to get on with learning by making presentations. Warwick John Fahy: Thanks for the interview. I enjoyed the questions and appreciated being able to go deeper into certain topics. Another tip, "Make your message tangible.If you make them think during a presentation, then while they are thinking, they cannot be listening to your subsequent words." So what has this got to do with innovation and creativity? Everything. If we can't present our ideas in a manner that has a happy ending we won't have a happy ending. Having a great idea is often insufficient, unless we are the entrepreneur with the investment funds. Most often we have to sell the idea and that means making presentations with clear messages and happy endings. Warwick John Fahy has a social conscience. For every copy of The One Minute Manager that is purchased a book is automatically purchased for the Library Project, which is a charity providing books for under-financed schools and orphanages in China. 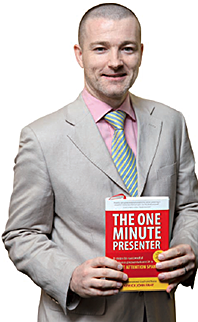 As stated at the beginning of this article, Warwick John Fahy has kindly made a limited-time offer to readers of IdeaConnection to experience the first three chapters of The One Minute Presenter without charge or obligation. Click here to take advantage of this offer. Warwick John Fahy, living in Shanghai since 1994, is a business presentation coach working with senior executives, business leaders and entrepreneurs in Asia and the Middle East. He consults, trains, and coaches senior executives in the key skills of communication and leadership. He is available to make presentations and conduct workshops at company-wide events, management meetings and team building events. Some of the topics he will cover are the one minute presenter, the change catalyst, and the bamboo leader. He will also act as a professional master of ceremonies at events such as awards dinners, annual conferences, CSR events, gala dinners, balls and trade shows. As a Certified Professional Facilitator, Warwick John Fahy facilitates leaders and teams in results-oriented, process-driven executive retreats, workshops and executive boot camps. He is known for demonstrating deep cultural intelligence, while collaborating with teams across China, Asia, India and the Middle East. He can facilitate in English or Mandarin. He is a recognized expert in the art and practice of executive public speaking. Warwick John Fahy was inducted into the Toastmasters International Hall of Fame in August 2007 for his pioneering leadership as chairman for Toastmasters in China. He is the founding Chairman of the Professional Speakers Association of China. To round out his varied interests Warwick John Fahy competes in Ironman triathlons, is an improvisational comedy actor, and host for stand-up comedy nights. Warwick John Fahy is the author of The One Minute Presenter (2009).